Congratulations to FOS for taking home the Friends of Parks Cultural and Structural Heritage award for 2016! Here’s a statement from Tony Magor (Natural Resources SA Arid Lands) regarding the award. On Saturday night, I had the pleasure in attending the Friends of Parks forum dinner at Marion, as part of the 3-day Friends forum that is held every second year. At the dinner, awards were presented for four different categories for projects undertaken by Friends groups over the past 2 years. There were many great projects undertaken by Friends groups across the state in each category, so it was very competitive. 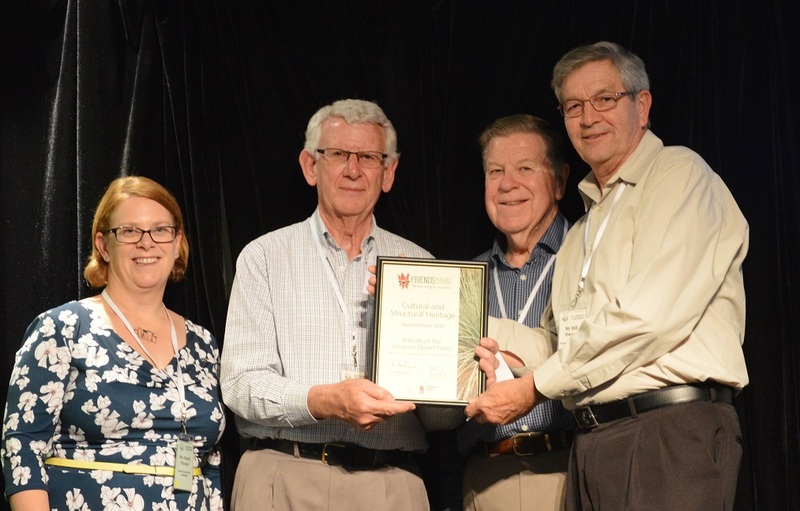 In SAAL, Frank Lyman nominated the Friends of the Simpson Desert Reserves (FOS), under the Cultural and Structural Heritage category for the replacement of the steps at the Dalhousie main spring, and it was terrific to see that FOS took out the award with some very good competition. The spring deck and steps helps protect a culturally significant spring by giving people easy access to the spring (instead of jumping in and water action/energy eroding the banks) and provides a high quality, low maintenance piece of infrastructure that has received great public feedback. Many volunteers hours were spent to complete the project, especially by Dean and David Moseley, and Bill Dwyer to fabricate the steps and deck before the different parts of the steps and deck were taken to Dalhousie for installation. The old steps were installed around 2002 as a temporary measure and were high maintenance so 13 years on, FOS helped deliver on a much needed outcome. It is not only a great piece of infrastructure, but with Frank and his crew working closely with FOS and those three gentlemen in particular, the project was about half the cost of what a contractor had quoted to undertake the same replacement work, allowing staff to spend the saved maintenance budget on other much needed maintenance works. So a great project, and a well-deserved award to FOS.